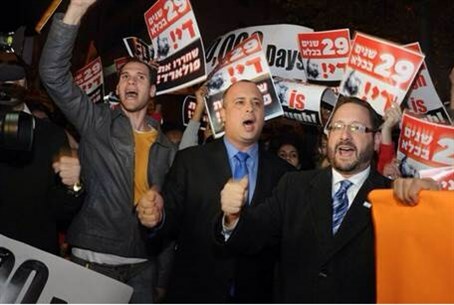 MKs Dov Lipman (Yesh Atid) and Hilik Bar (Labor) took part in the demonstration. Hundreds of people demonstrated Thursday evening in front of the David's Citadel Hotel in Jerusalem, where US Secretary of State John Kerry is staying, and demanded that Jonathan Pollard be freed from US jail, after 28 years of incarceration for espionage on behalf of Israel. The protest was initiated by "The Guild," the student union of Bar Ilan University. Guild chairman, Matan Bar Noy, told Arutz Sheva that just as President Barack Obama gave a speech directly to Israeli students at the Jerusalem Conference Center, the students now want to speak directly to the US Administration. MK Dov Lipman (Yesh Atid) took part in the protest and said that “as a former American,” he understands why Pollard was punished – “but now even the senior officials say that it is time to release him. It is humanitarian, and that is true justice,” he said.